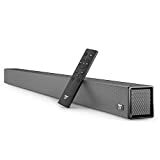 TaoTronics’ 25-inch sound bar found itself at the top of Amazon’s list of best sellers for much of the year in 2017. It offered solid sound and a sleek design for an unthinkably low price, so it’s not exactly a mystery why it was so popular. 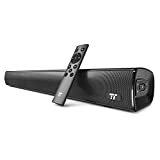 For 2018, the company has updated its popular TaoTronics Sound Bar with a number of improvements and new features, and it’s currently discounted on Amazon. $65.99 is an insanely good price for this home audio system, so you should definitely check it out before the deal vanishes. 25″ Sound Bar: No need to have a spacious living room to enjoy better audio playback! This compact soundbar installs unobtrusively in bedrooms and small environments. If you’re looking for a bit more oomph, there’s also a 34-inch model available for just $85.